A power outage can leave your freezer full of spoiled food. It is important to clean out the freezer and remove any odors before putting new food in it. This is a guide about cleaning a freezer after a power outage. After Hurricane Ivan, power was off for 8 days, lost every thing in the freezer. I could not get home for a while, now the freezer has a horrible smell and I can't get it out. Tried bleaching the entire inside and still nothing. Also have baking soda inside. Try using charcoal in the freezer. I have heard it works for those experiencing odor problems. I would also consider leaving the freezer door open as I was told a non-working freezer with closed doors will result in smells. Finally, my mom always recommends vinegar for everything. It is worth a try. Turn the freezer off, open the lid and let it warm up. Cleaners are not effective at freezing temperature. Use a sponge mop and scrub it out with an ammonia cleaner, but never mix it with bleach. That produces poison gas. If that does not do the trick, then the cause of the smell is from the insulation or the mechanical compartment. Do not use straight ammonia or strong solvents, because they make the plastic freezer liner brittle or damage it. I had the same problem with my freezer after Ivan. I had lots of fish and shrimp in mine. What a stench!! After emptying the contents, I turned off the power and used a strong solution of white vinegar and "mountain fresh" scented Clorox bleach in water. I wiped down everything, including the racks, and in the grooves of the door gasket. After everything had dried, I placed some of the same scented Clorox into a glass dish and set it on a middle shelf. I turned the freezer onto the lowest setting and left it for 24 hours. It still had some lingering odor, so I left it one more day. Perfect! It's just like a brand new freezer!! I used this same thing on my garage refrigerator with success, and my house refrigerator as well. It takes about a day for the bleach smell to dissipate, then you are back to normal! Charcoal works great for getting rid of odors. Take regular charcoal, not briquettes, and put some in the freezer along with some crumpled up newspapers. Leave the door closed for a couple of days. That should remove most of the odor. After you get rid of the odors, you can wipe down the interior with Vanilla Flavoring, that will help too. Clean the freezer with a paste made of baking soda and Lemon juice. rinse it thoroughly. Charcoal does work well but make sure you DON'T use the self starting kind, just use the plain old briquets. I read somewhere just today that someone had a similar problem and what he/she did was to wipe out the inside with vanilla extract. You might try an old pair of knee high socks, fill them with fresh dry ground coffee. Put the filled socks in the freezer with the door closed for several days...should do the trick! This is also a great way for when you are moving; a refrigerator or freezer can be closed up for days. If in storage months!!! The coffee is a life saver. Several years ago we had a power outage while we were out of town. When we got back our freezer was filled with rotten meat. We tried everything, and I do mean everything!! Nothing worked until we put saucers filled with cat litter on every shelf. We closed it up and did not open the door for about 3 or 4 days. When we did open it the rotten smell was gone. We wiped it down to get the cat litter smell out and then left the door open for a couple of days. Viola'! The freezer was good as new. I noticed several people mentioning "charcoal" in this thread. Exactly, what *kind* of charcoal should be used for this purpose, and where does one get it? Are you supposed to leave the fridge on and running or off? I had the same problem after Frances. The inside of our fridge is clean but the tile floor around it smells rotten. It seems to get worse when the fridge turns on and off. Any tips? I had the same problem after cleaning out my freezer. TERRIBLE FISH ODOR! We tried the newspaper, coffee grinds, vanilla, bleach and baking soda. Nothing worked. I was ready to bring this 2 year old freezer to the dump just to get the smell out of my basement when i decided to give it one last try. I sprayed about 1/2 bottle of lysol mold and mildew spay all over the racks and coils, especially the tubes running down the back side. Then i got a kitchen bursh and scrubbed all the racks and coils and rinsed about three times with plain hot water. I even sprayed some down the drain tube and rinsed that. Well the smell is GONE!!! There must be something in that cleaner that neutralizes that fish smell. Good luck!! We had our freezer go blink also, we have removed everything even the freezer, the house still smell bad, how do I get rid of the smell in the basement and the lingering and coming upstairs?? I've already disposed of the rotten meat from broken freezer, there is about 4" of bloody water standing in bottom of freezer. I'm going to dispose of the freezer, but how do I dispose of the bloody water first? The smell is unbearable! How do you get rid of bad smell from a freezer. I had a vacation for six weeks, when I came back my freezer had stopped working. There was some meat in there which was rotten and I can't get rid of the smell. It smells like dead carion. I have used all the suggested things (e.g.) bicarbonate of soda, I have steamed it with boiling hot water, and left it outside with the door open. If anyone has a another solution, I would be happy to try it. My niece had the same problem. She scrubbed with bleach, aired it out, filled it with newspapers, put pans of baking soda, pans of cat litter. What FINALLY worked for her was to place a large container of fresh ground coffee beans on the bottom, close the door and let it sit for a week, closed up. You need to use fresh, dry, unused coffee grounds, not the wet grounds left after you brew coffee! I made the mistake of plugging my freezer into a GFCI outlet. The outlet tripped and it was about a week before I noticed. Needless to say everything in the freezer had to go. The smell was over-powering. I took everything out of the freezer. There was blood and water at the bottom. I poured baking soda, lots of it and used a scented cat litter. I let it sit for a couple of days. Cleaned it up and it was smelling good too. This did the trick for me. I've also heard to use pure vanilla extract but I didn't have any. I will report my results tomorrow. Eons ago I was a refrigerator/freezer service technician. If liquids like blood leaked into the insulation you have two options: pull the liner out of the freezer and replace the insulation, which takes two people who really know what they are doing, or replace the freezer. 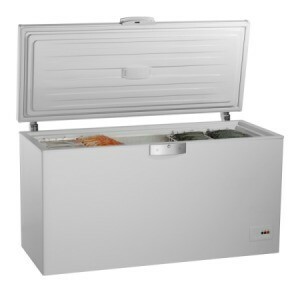 If you pay to replace the insulation the cost will equal or exceed the cost of a new freezer. How do you know if the blood is in the insulation? My freezer went out. I threw everything away, but didn't clean it. It needs to be wiped out. The smell is gone, however I had to put a bag of meat in the freezer. Will it ruin it till I can get to it? It is really cold out, but won't be in a couple of days. Can I wait? NJ had that bad winter last year. We never got around to cleaning the freezer out after it failed somewhere around Christmas. After a while we just forgot about it. So now, July 1st, the freezer stinks and we won't forget that. Are the fumes going to be toxic to breath in? We just survived Hurricane Katrina and are now beginning the clean-up. We emptied our chest freezer of all the contents right after the storm hit, but now it smells awful. The power has just now come back on after 10 days. How do I clean it and get rid of the awful smell before I can use it again? My niece bought a big new deep freeze and quickly filled it with bulk purchases of various meats she found on sale. Unfortunately, it had to be placed in her attached garage and her kids were horsing around and unknowingly knocked the electrical plug out of the outlet. She discovered this WAY too late! She did the clorox bleach, the cat litter, the baking soda, the crumpled newspapers and still had a bad odor. of beef. And it went past 10 days before we noticed. me know. I wish you health, love and joy. Katrina broke many hearts yet makes so many stronger. My mantra has always been; I may fall in the mud but I refuse to roll in it!